One of the downfalls of man is his inability to admit he doesn't have the required knowledge to complete a task, give up and seek help from someone wiser. One only has to look at a lost couple to illustrate this point – the female will likely ask a stranger for directions within seconds while the male wrestles with maps, prods sat-navs and generally gets hot under the collar.> The same goes for mechanical issues. Yes, there are plenty of capable chaps out there that know the difference between a blown gasket head and a faulty fan belt but there are also many that don't. Research carried out by BAA Reman, the world's largest automotive remanufacturer, has uncovered the top ten strangest DIY repair attempts made by its customers (some of whom are women). 1. 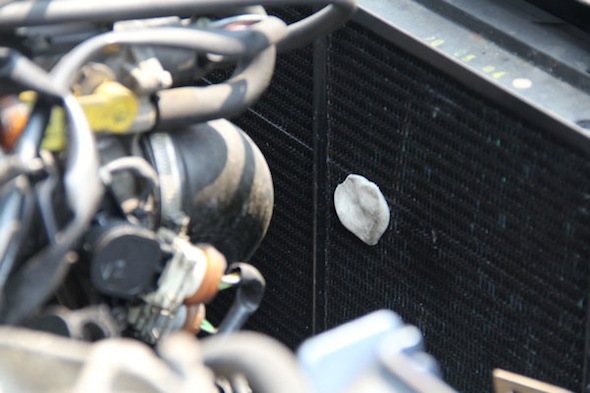 A man in his late 30s attempted to use bubblegum to try and fix not one, but five small leaks in his car radiator. He also poured 250g of black peppercorns into the radiator, after reading that ground black pepper could help repair radiator leaks. All he got was a strong odour inside the vehicle and a serious blockage. 2. An electric fault caused a woman's front headlights to stop working, so she decided to secure two battery-operated torches to her bonnet with rope. 3. An elderly man with faulty air conditioning attempted to cool down during one particularly hot week last summer by taping 20 handheld battery-operated pocket fans to his dash board and switching them all on at the same time. 4. A couple noticed their speedometer wasn't working, so bought an iPhone 4, downloaded a speedometer app and then fixed it to their dashboard with an iPhone holder. Despite being one of the better DIY repairs to come from the research, it wasn't the most accurate way of monitoring the speed of the car. Regardless, the couple used this method for six months before seeking help. 5. A 19-year-old man from Bristol found what he deemed to be an ingenious way to fix a leaky exhaust pipe, with a few empty beer cans cut open and wrapped around the damaged area, sealed with brown parcel tape. 6. A woman in her late 50s, who had managed to lose both sets of keys to her Volkswagen Polo, decided that she would wrap heavy-duty chains around her car when not in it. She then sealed both front doors shut with two equally heavy-duty padlocks to prevent thieves from getting in. 7. A man from Leeds, who had managed to snap off his indicator lever, decided to replace it with a twig to make sure he could successfully indicate while on the roads. 8. When a young driver from Stroud noticed that his sunroof was stuck open (thanks to a faulty electronic opening/closing mechanism) he improvised with an open umbrella and a hefty amount of duct tape. It kept the rain out but did nothing for security. 9. Despite airbags being a vital safety feature in modern vehicles, a male driver from Yorkshire decided to take matters into his own hands after being informed by a mechanic that there was a fault with his. He cut out various sized sections of memory foam from a mattress topper he had in his home and glued them to the different sections of his steering wheel, thinking that the soft material would be sufficient protection in the event of an accident. 10. 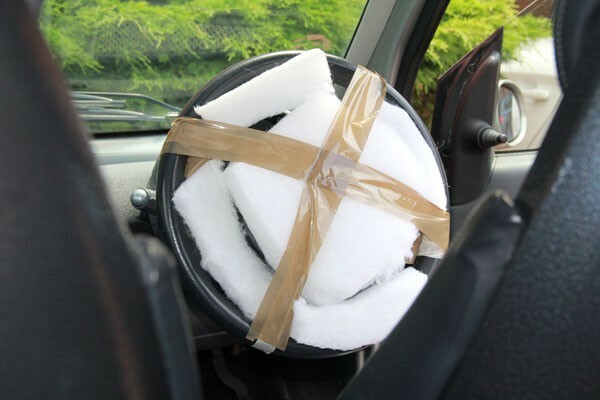 A married couple from Epping decided that in the absence of their car's bonnet, they would opt for a double duvet cover to protect their engine and vital parts from the elements, secured down with trusty duct tape.